Having a knack for playing the bad guy expertly well must give you a certain level of kudos in Hollywood. An actor who has perfected the art of the villainous role is Faran Tahir who stars as Minister Patel in new sci-fi film Elysium alongside Matt Damon. It’s set to be one of the blockbuster films of this summer. As Minister Patel Faran is elected to lead 8,000 super-high-net-worth citizens amongst the perfect world that Elysium represents, and the role is a tough position to hold. He’s caught between keeping the orbital space station exclusive to the privileged few but also sympathetic to the needs of the people that need its help. Ahead of the film’s general release this week Faran talks to Elysium Magazine about the film, always playing the bad guy and being on set with Sylvester Stallone and Arnold Schwarzenegger in his next movie Escape Plan. Elysium Magazine: The new film Elysium looks to be a very exciting movie – how did you find the filming? 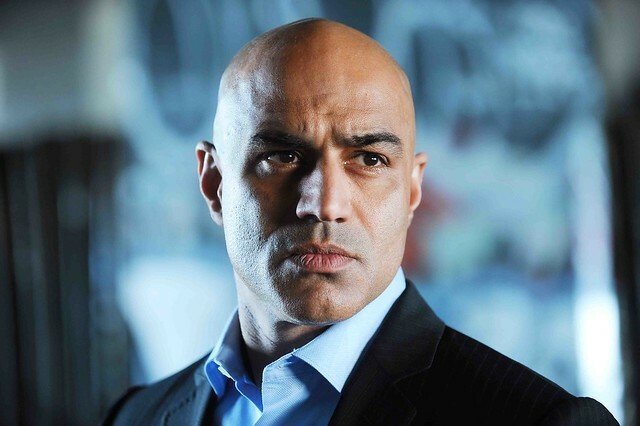 Faran Tahir: The shoot was every bit as exciting as the final product. We knew that this was something special. EM: You seem to be Hollywood’s go-to guy to play the villain – is this something you purposely wanted to achieve when starting your acting career? FT: Actually I have done almost 20 films and television projects in the last three years and only played five villains. But villains do stick in our memory more. It would be a career suicide to just play the villains. EM: It’s more fun playing the bad guy though, right? FT: It is a lot of fun to play the bad buy. You don’t have to worry about being liked. You can make it quite delicious. EM: Which has been your favourite villainous role so far? FT: Iron Man (as Raza) was a lot of fun. EM: Would you ever want to play the good guy? FT: As I said, out of 20 only 5 were bad guys. I have three movies coming out this year, Escape Plan, Torn and Jinn. The characters are very varied. So check them out. EM: In the film the space station Elysium sounds like a perfect world. In reality would you be comfortable living in such a place? FT: I have no issue living in a perfect world as long as it is accessible to all. If the perfect world is exclusively for a certain group then I have a problem. EM: Elysium explores sensitive political and sociological themes such as immigration, health care and class issues, almost like society has come back on itself. What’s your take on this? FT: I think Elysium does hold up a mirror. It challenges us to take stock of where we are and where we are heading. We all need to pause, truly evaluate and make course correction or the reality of Elysium might not stay such a fantasy. EM: Finally, you star alongside Sylvester Stallone and Arnold Schwarzenegger in upcoming film Escape Plan – what was it like filming with such Hollywood royalty? FT: It was absolutely amazing. They are icons of the action genre. Their professionalism and dedication was humbling. EM: Who’s funnier on set – Sly or Arnie? FT: They are both hilarious in their own way. I also enjoyed how they acted like young boys with toys around each other. Elysium is out in cinemas from 21st August 2013.